I have been an educator for 30 years, and I truly believe in the words of teacher-astronaut Christa McAuliffe: “I touch the future. I teach.” I get to touch our future every day, so when I learn about new practices that will benefit kids, I wholeheartedly jump in. 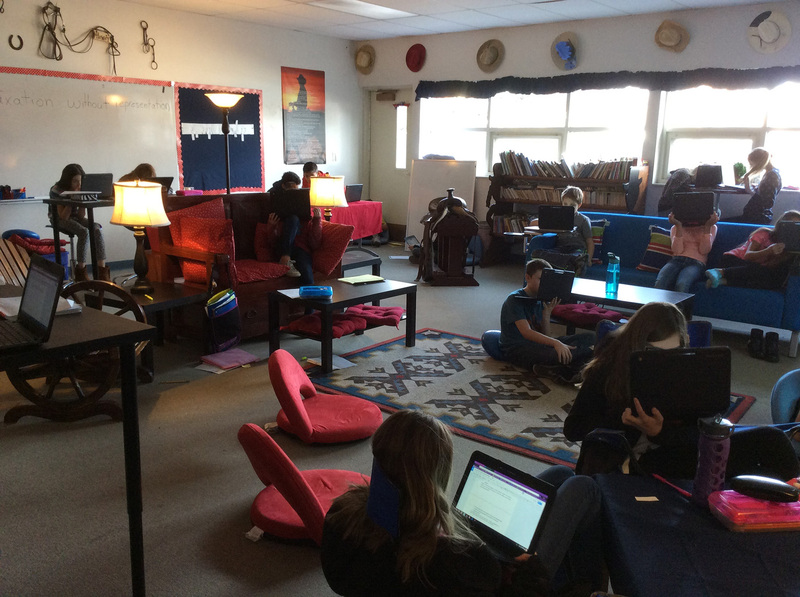 I recently switched my classroom from traditional to flexible seating and I will never go back. 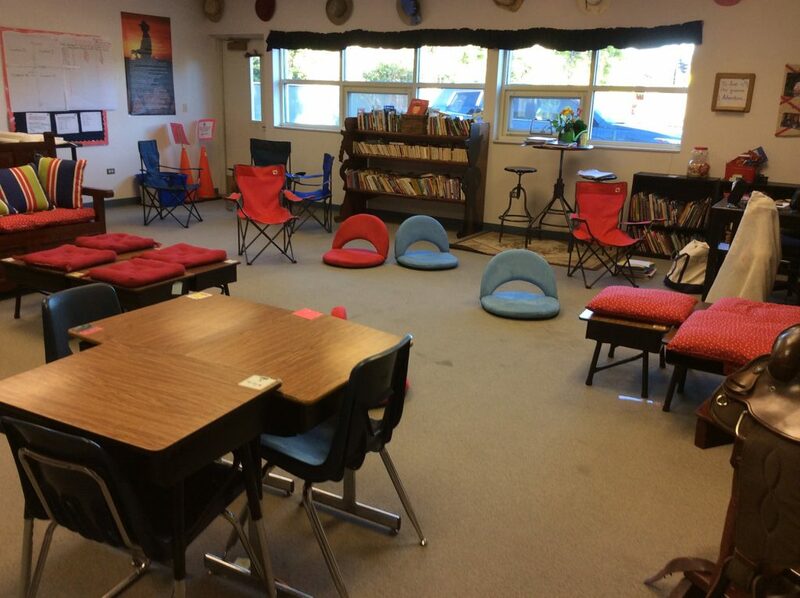 The idea is to create a more comfortable environment that helps students be their best learning selves. 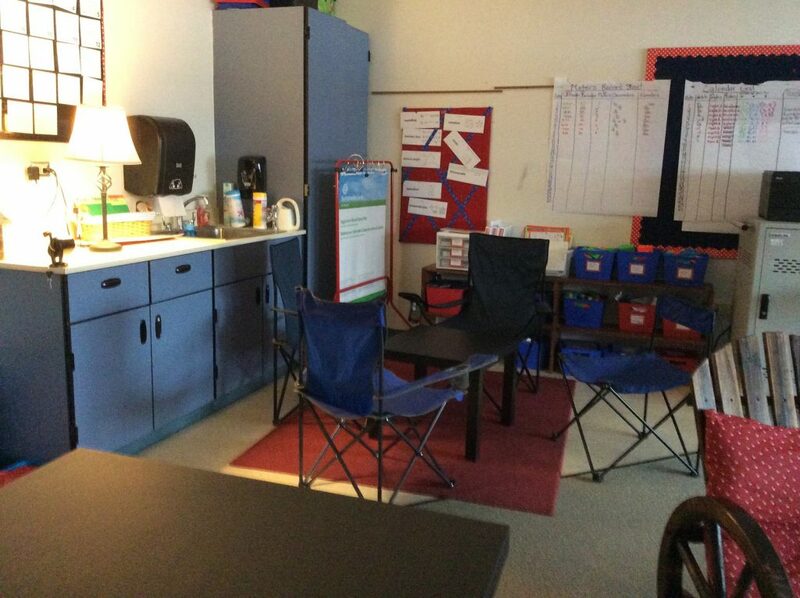 My classroom now looks more like a coffee shop or a living room than a traditional classroom. My administrator was thrilled when I approached her with this concept. I did my research and looked at examples, including “Why the 21st Century Classroom May Remind You of Starbucks” by Kayla Delzer. Delzer’s words and other success stories of teachers around the country convinced me to go this route. I have given control of my room to my students. They choose where they want to sit daily. There is a variety of high, medium and low seating, including a couch, seating cushions, camp chairs, small rugs and stand-up tables. 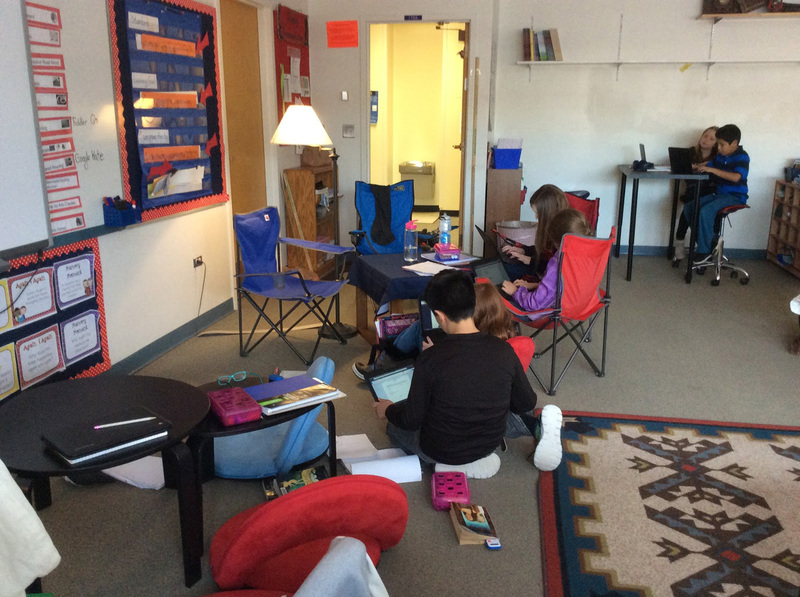 Students choose where they sit daily, but wherever they choose to sit, it has to help them be their best learning self. Students move the furniture based on their needs; even laying on the floor is acceptable, and sitting by friends is allowed. If a student can’t abide by these rules, I simply move his or her comfy chair somewhere else, and students also move their own seating when there is an issue. My teacher space is less; I spend my time in the room working with students. 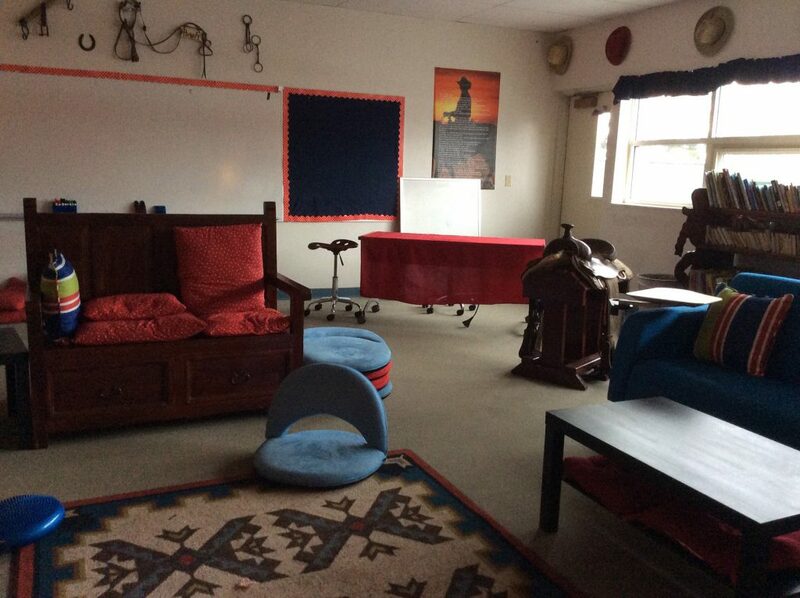 The room has become “ours” instead of “mine,” and this has given my students a sense of ownership and enabled them to become invested in their own education. I have witnessed a change in their commitment to learning and behavior. Being comfortable somehow allows the student to stay vested in the task, and their behavior is equally positive. They are willing to work with others, share ideas and move around the room. There are enough options for everyone, and they take their comfortable seats wherever they go. I have come to realize that not everyone can learn sitting up in a chair. With so many options, students find what works best for them in the room. My students learned to give up their personal desk space and simplify their supplies. Each student has one bin for supplies, and common items are in one spot for easy access. Dry-erase boards fill my room instead of fancy posters, which allows the kids to generate what we need. Necessary posters are on a hanging-chart stand in one common place for easy reference. Our room also features 3 tall tables where students can sit or stand. There are 2 separate gathering places with 4 camp chairs and a small central table. These students figured out that the table was in their way, so they quickly moved it. The blue bulletin boards on each side of the dry-erase board have now been transformed into additional dry-erase boards. The students need them to collaborate, study, review, and think. I turned to Pinterest for advice from teachers who have been successful in making this change. I took the legs off 12 of my students’ desks, creating desks that sat approximately 8–10 inches off the floor instead of the standard desk height. Twelve students could now choose to sit at these short desks on the floor. I purchased cheap cushions for their new seating. I purchased two tall tables and eliminated 6 more desks. I also made cute clothespins with each student’s name on them and a sign designating the maximum number of students who could use each seating spot. On the first day of school, I introduced the basic rules for flexible seating. Each day the students had to try a different spot. Their clothespins reserved their spots for the next academic day. This is my classroom prior to starting the transformation—very traditional and too crowded. Notice all the desks. They take up space and leave no room for creativity or student freedom of movement. The coatrack takes up space as well. Even though I had my desks arranged in what I thought was a unique pattern, it didn’t allow for movement or comfort. The bench was relegated to the back of the room to allow space for the 30 desks. With seven different types of seating available, it took about 2 ½ weeks for students to try all of them. After that time, I allowed students to “free choose” each day. It became obvious after the first several months that students could handle working with their friends, and we eliminated the signs. I had a few issues with students not being able to focus, but when I did, I simply asked the student to move to a new spot with his or her comfy seating. It wasn’t a problem because they couldn’t argue with my philosophy that students should be able to be comfortable and learn at the same time. I was able to get more teaching done, and the students were able to get more learning in, as they quickly got ready each day so as not to lose their choice spots. After the first month, the students were ready to eliminate even more desks. I asked if any students wanted to “desk/locker share” with a partner. This brought on a HUGE response. 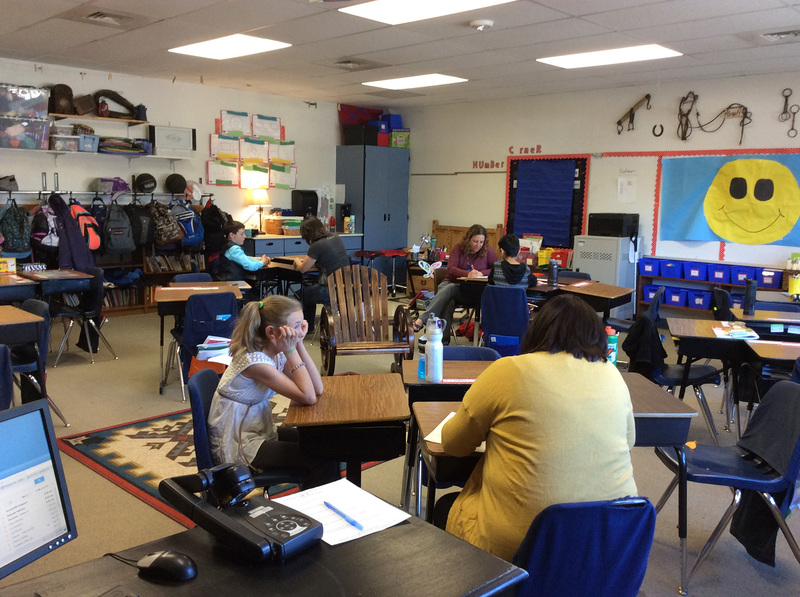 Pairs quickly formed, and students moved desk items into one space instead of two. We eliminated another six to eight desks. Collaboration and neatness came into play for those sharing storage space. 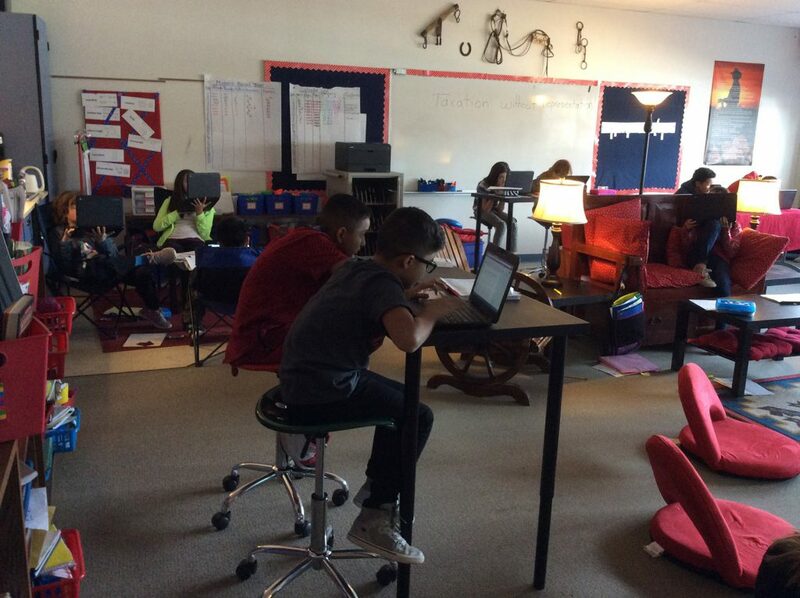 Desks were becoming a place to work instead of “homes” for individual students. We finally had only six desks out of the original 30 by mid to late September. I placed a tablecloth over these after we emptied them and gave the remaining students cubby bins. Now that all students had a bin on one of the bookshelves against the wall they no longer wanted the desks. The chairs that were left for the two desks-turned-tables were cumbersome and took up too much space. We wanted to get rid of these as well, so I purchased two coffee tables with shelves underneath. These replaced the final desks and chairs. I also eliminated the overhead fluorescent lighting and replaced it with six classroom lamps to add to the calming mood and living-room-like setting. My blinds stay open all day for natural lighting. We did face a few challenges along the way, but not many. Moving the desks out created a bit of a headache for our building’s custodian. I also had the coatrack removed from my room. This created a HUGE amount of freed-up space that we didn’t realize we had. The coatrack is now in the hallway, and we have to keep that area clean. We are deliberate with where backpacks are hung up (by size and weight now), as well as coats, boots and lunchboxes. My principal purchased two movable cubby holders for my classroom. The bins are smaller than we would have liked, but they work. This space helped us to downsize our materials. We don’t need so many folders and spirals, and it’s easier for the students to keep track of their items. There’s no more “desk diving” to find something. I also keep one shelf of extra supplies, including pencils, sticky notes, paper and markers. Students no longer waste an entire session trying to find a pencil. Yes, whenever a new piece of furniture appeared in the process, everyone wanted to sit on it or use it. Simple solution: draw sticks. This solved the problem. I have had my teammates’ students ask if I can convince their teachers to change their rooms too! I have created a wave of enthusiasm in my building, for the better. Other students will literally run to be first in the room so they can go to their choice spot. What a fun dilemma to have — to have to rush to get into the room to learn! To make this change, it required me to believe in it wholeheartedly. I had to change my mindset and be open to the idea of the constant movement of the students sitting where they wanted in order to be comfortable. I used to have to schedule “brain breaks” about every hour when we were still in our seats. The brain break activity would get the kids up and out of their hard plastic chairs and desks and moving for a few minutes before we would go back to sitting again. We no longer need that resource. The students automatically move when they need to and change positions in their seating arrangements. In fact, I notice they are so comfortable that they no longer complain of having their bottoms fall asleep or their backs hurt like they did when they were in desks. They can stretch their legs out and not worry if their feet end up under someone else’s desk or in their personal space. I often see kids working back to back in camp chairs with their feet up on the table, unaware of anyone else by them, even their best friends. 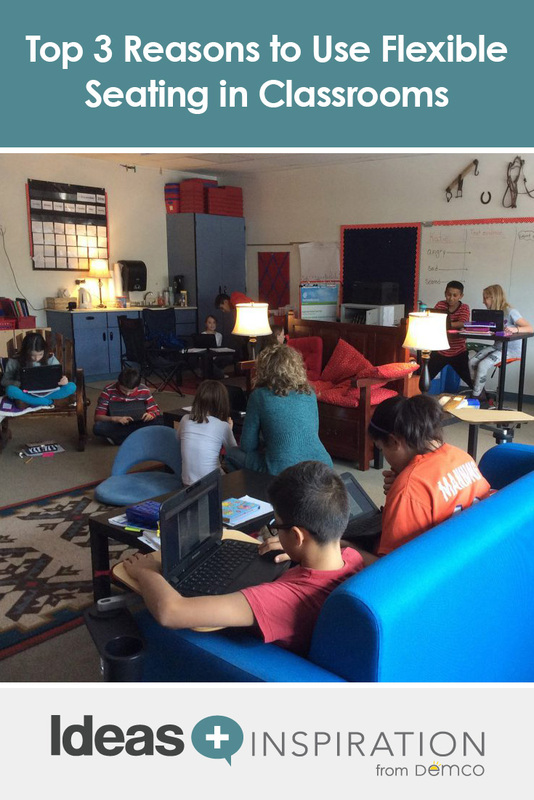 The benefits of flexible seating far outweigh any negatives. After making all these changes, I will never go back to traditional seating. At this year’s parent-teacher conferences, all of the parents stated that their child has a completely different attitude about school now. The kids love coming to school and learning, and they couldn’t be happier. I couldn’t be happier either. We have noticed we have so much more room, and everyone remarks on this since the change. As I continue my classroom transformation, I’ve added a small popcorn machine, hot cocoa on cold days, a jar of snacks (each student can have one snack per week from the jar), and I have plans to add more greenery with live plants. If you want to make this change in your learning environment, it’s important to remember to have a positive mindset and recognize that this process takes time. To create an environment that looks like a living room or a coffee house, be deliberate with your choices and remember to color coordinate the room. All of my boards are navy blue with red trim, and my theme is “cowboy,” with western antiques on the walls. My furniture is also color coordinated. Students can handle the real thing, so when you add furniture, make it nice by painting it or covering it. Take that extra time and your students will truly appreciate it. If you start small and seek out the advice of others who have gone through this process, it will help ensure a successful transformation. The results — a more active, engaged, enthusiastic, and relaxed room of students — are worth the effort. For more information about my journey, visit my blog at studylikestarbucks.blogspot.com. Post your comments below, and I will happily respond to any questions you have and support you in any way I can. Where did you get the awesome blue couch? The couch is Motive Powered Lounge Seating. If you’re looking for additional colors, please contact a sales specialist at 1.800.747.7561. Thanks for your interest! Where is the blue couch from? It’s a popular piece of furniture! The couch is Motive Powered Lounge Seating. If you’re looking for additional colors, please contact a sales specialist at 1.800.747.7561. Thanks for your interest! I love the idea of flexible seating. I’ve seen multiple posts about flexible seating with younger grades. I completely agree that students are going to be more likely to learn/want to learn if they’re comfortable in the room, both physically, emotionally, and mentally. Personally, I’d like to get rid of all the individual desks in my room and at least get tables. I’m wondering if you have any suggestions for utilizing flexible seating at the secondary level? More importantly, if a student misbehaves to the point where they are no longer allowed to use the seating, and there are no “regular” desks left in your room, what do you do? You have a great question! I am glad you like the concept of flexible seating. It does work and has so many advantages. A.) Have the student sit nearest to you, on the floor or a cushion, or get 1 student desk. You can use this as not only for those times when a student needs to be by himself/herself but also for when a student wants a “do not disturb” place in the classroom. I have had times where a student needs to be away from others, for both positive and negative reasons. Always ensuring they are comfortable in the designated spot tends to make the separate spot easier to digest. When this spot is being used by someone else as a quiet space and you need it for another student, simply let the one currently there find another comfortable space while you let the other student sit there for a while. I remind the student I am having him sit there so I can assist him in being the most successful he can be while I focus on the academics nearer to me, so that he can be successful and feel good. It is hard to argue with this logic! A) Start with the three types of seating options: low, middle, and high. Seating options include a tall table that can easily move, along with some regular desks, then floor seating. I suggest you take a poll of your current students: see how many prefer sitting/standing. Have some high seats (stools) for the tall tables. These should be movable as well. Sometimes students push the stools/chairs away from the tables to work. This should always be an option. I would keep a handful of regular desks/chairs (4–6) for those that like their own designated space or prefer the traditional. With only a small amount of desks, this allows for greater movement in the classroom. B) Start simple: Move out 3–4 desks for every table option you move in. Make sure you have storage for any materials that were displaced when you moved desks out. I keep my tall tables on the perimeter of my classroom. When we need them in the middle, they are easier to move. Keep floor space between all of the seating options for ease of movement as well. If you have any other questions, please feel free to email me further. I am always happy to assist. Great information!! What do you do about standardized testing when students have to do individualized work? I have so much extra space now with the desks gone that furniture was easily moved to accommodate students. I have privacy screens, so we used these around each screen. I had an administrator come in to check out the configuration (students helped me get createive!) to ensure we weren’t violating any rules. I also had my students open their screens, making sure they couldn’t see anyone’s work. This all worked just fine. Do your students have departmental? I teach three grade levels and wonder how this could work? I am always changing up the desks and arrangement in my room trying different things, but it still comes back to departmental. I need some of your thoughts. I am not quite sure what you mean when you refer to “departmental.” Do you mean grade levels departmentalizing…i.e., one teacher instructing the entire grade level in Math, for instance? If that is the case, my grade level and the level before mine (4th and 5th) are departmentalizing next academic year. I will house all of the math materials for my grade (5th) and instruct all students in 5th grade math. If this is what you mean, I can assist, but I need to know more specifics. I would be happy to connect with you to help further. I am looking for research based articles or books on Flexible Seating. I am trying to support my belief that flexible seating is beneficial for students. I have come across a couple of articles, many great posts, and blogs but I still feel I am missing the “why” behind it all. I am trying to find where this whole idea of flexible seating came from. I would really appreciate your help. Thank you so much. 4. 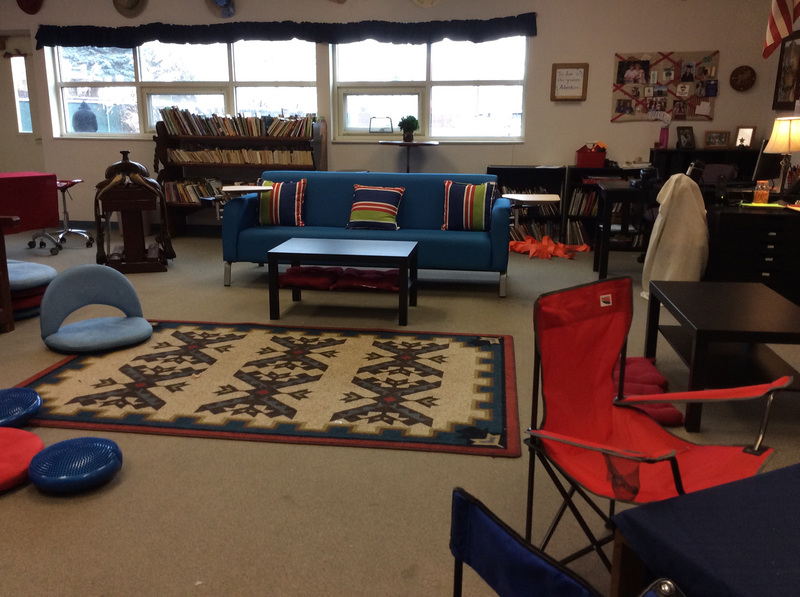 Flexible Seating: What Is It and How Does It Benefit? What does your normal day look like when you teach math? How do your groups work? How much time with the groups? Do you do any whole group teaching? Do you work through stations? Thanks for asking great questions. As educators we wish (at least I do!) that I could see into every great teacher’s classroom and get all the wonderful ideas he or she does from day to day. I would be a rich teacher, indeed, if I could! My school is rather large. There are three sections of 5th and three sections of 4th and 3rd grades at my building. K-2 have 4 sections each. I teach 5th graders. 8:16: Bell rings. Pick up class from playground. Bring them in. Hang up backpacks and items in the hallway. Our building principal just had all coatracks moved into the hallways. I LOVE the extra space it provides me! Morning routine (morning meeting), lunch count, attendance and that sort of thing. Kids sit where they wish unless there is a specific task at hand. Starting this school year, my class will meet in a circle in the middle of the classroom for morning meeting. This is where the largest area rug sits. I call this area the “anchor space.” The couch and the bench frame this spot. I have approximately 90-100 minutes for each math class. Around 2:50–3:25 daily my building has its primary and intermediate arts classes; we are an academy of fine arts. I will usually have whole-class instruction to start with. We gather in the back of my room for “Number Corner” a hands-on part of the math curriculum my district uses (Bridges). After the Number Corner part of the lesson, we head to the front of the room for the one-hour lesson and individual and partner work. During the final 15–20 minutes of instruction, I reinforce and support small groups of 1:1. I use many entrance and exit tickets and the program’s built-in checkpoints to determine who needs support the next day. I plan to create different room arrangements for testing (quizzes and unit tests), small-group work and whole-class instruction. These arrangements will be placed on chart paper and kept somewhere in the room for reference for the kids. I will also arrange partners based on skill needs. Enlisting the kids to help decide where to move furniture during these different times helps them LOVE the movement and gains buy in. I also have stations, which in our curriculum are called “work stations.” Kids have individual folders with their work station papers in them. Every time they go to a “station” they check it off in their folder. Sometimes I assign partners and specific work stations, depending on their latest understanding of the topic, sometimes they can choose. In my room the plan is to house all the math materials for all three classes, including workbooks and manipulatives. I am color-coding by class. First class is yellow (across the entire grade level), the second class is blue and the third is green. Workbook bins will be color coded for easy reference. Students carry their cubbie bins with them to each classroom. I believe this answers all your questions. Please email again with any further questions. I have a new blog you can refer to for more specifics and photos: Coffee Shop Classroom Blog. School just started here in Jeffco, so I’ve been doing flexible seating all of two days! HA! No one in the school is doing it, but my kids, and most parents, are excited for the innovation. However, I’m wondering how you handle self-selection conflict if one type of seating is more popular than another. If there are conflicts with more students wanting a limited seating type, we discuss: Who wants it today and then who tomorrow? Alternate students, reminding them they will have the opportunity to try all seating areas. This is a horrible idea. As I read through blog after blog and article after afticle, including your article and the replies, all I notice is that nearly every paragraph begins with or is centered on “I”. What “I” did, what “I” think, what “I” needed, what support “I” got. Can anyone produce any quantifiable evidence that this experiment enhances a student’s ability to learn? This is not a rhetorical question. Please respond with any evidence of student improvement. Please do not respond with your thoughts on the matter. My granddaughter entered third grade this year and is disappointed, saddend and embarrased that she and her group have been assigned to the “little table”. This is a table approximately 8 inches off the floor with some sort of short stool, leaving the children trying to do schoolwork with their knees up around their ears or their legs under the table pushing against the legs of the other students. She hates school and doesn’t want to go. 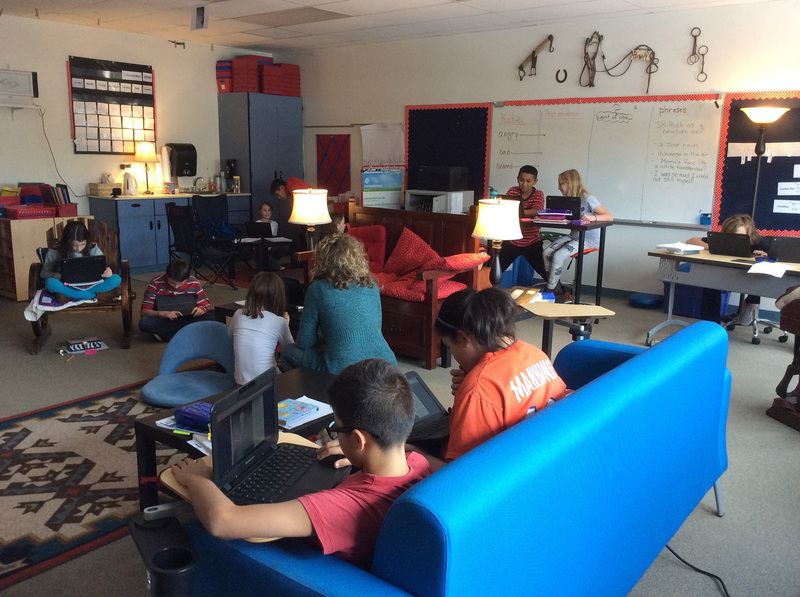 Her principal says that they are all really excited about the idea of experimenting with flexible seating and that she doesn’t know how individual teachers are integrating this “exciting” new theory into their classrooms. She was just too excited about the excitement in the teaching world over this exciting new teaching tool for words. Any word besides “exciting”, that is. My granddaughter is a shy, but friendly, eager-to-please “A” student. At least she has been until now. I understand the value of competition in a learning environment, but children should not have to compete, that is, race to class hellbent for leather and filled with anxiety, to get a comfortable seat, adequate for performing whatever task is assigned. In fact, the lack of such seating and being forced to sit at “the little table” borders on child abuse. This is the third day of school and Dallas tells me that, if she can get enough classmates to vote for her as the VIP, she can sit at a special table by herself that has a lamp or at a regular table. Until she can garner enough votes though (or until her parents reach the school board), she is stuck at the “losers table”. Thank you for your comments. Best of luck as you address your concerns about your granddaughter’s classroom with administrators. For more research-based information on the benefits of flexible seating, check out EdSurge.com> and nea.Today.org, as well as the resources listed in the previous comments. Thanks for being concerned about the way flexible seating is working in that classroom. Flexible (or alternative) seating is more than just bringing in comfy furniture. With it comes a philosophical change for both the educator, children, and parents. When we think of being comfortable to learn or concentrate, we have our own individual preferences. Just think of the last time you went into a Starbucks. You look for a type of furniture you want to relax in or that will help you concentrate. It’s the same with students, and they should be given the same opportunity. 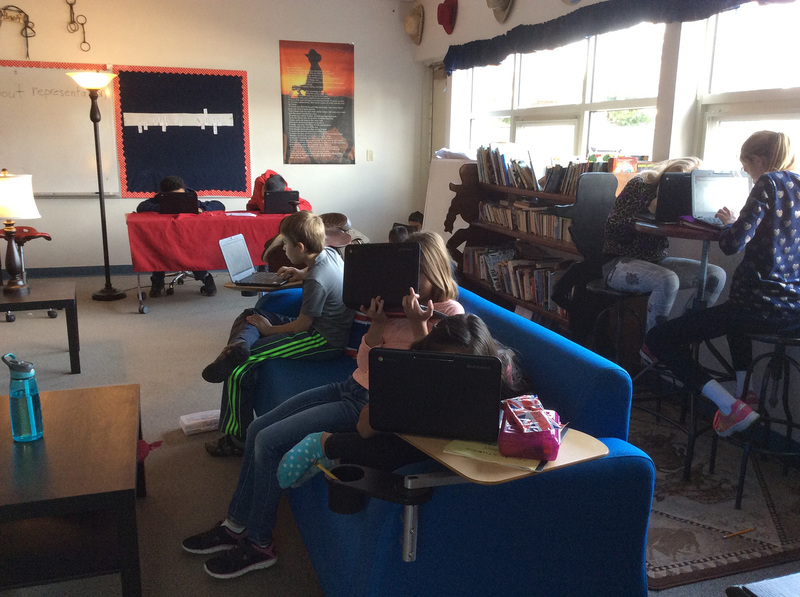 Flexible seating is designed to engage students for greater periods of time, due to the placement of comfy furniture and the ability to address different learning styles. Some people like to stand and move. Some prefer sitting in movable furniture on wheels, while some prefer sitting low to the ground. The one guiding rule is this: students need to be engaged and focused on their work. Teachers can also move students for educational purposes, as driven by the educational task. But students need to be involved in the process as well. They need to learn what types of learners they are. This helps them figure out what type of seating works best for them. The teacher should give the students these learning-style inventories to pinpoint what types of learners are in the room. Then furniture arrangements can be configured to best meet those needs. Sometimes students are asked to sit in certain places in the room, but these shouldn’t always be their assigned spots. They should be allowed to move around the room and try new spots. That is what flexible seating is all about: the freedom to move and relax. Everyone benefits. 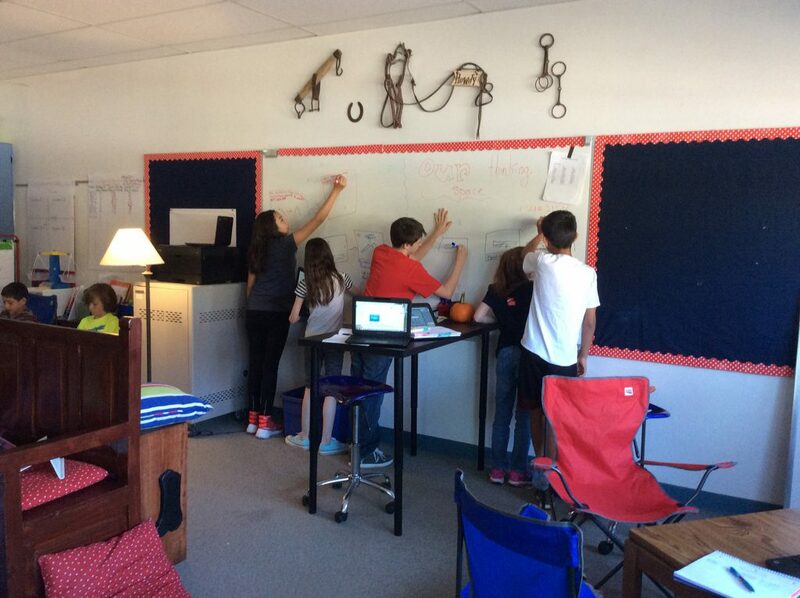 I agree when you say that you would want to find classroom furniture that gives students control over the room. Finding something that will keep them more comfortable and engaged for the whole class period would be another good goal. It would also be smart to find a supplier that is qualified and produces quality materials to ensure that everyone is happy with the results. We couldn’t agree with you more, Hannah! 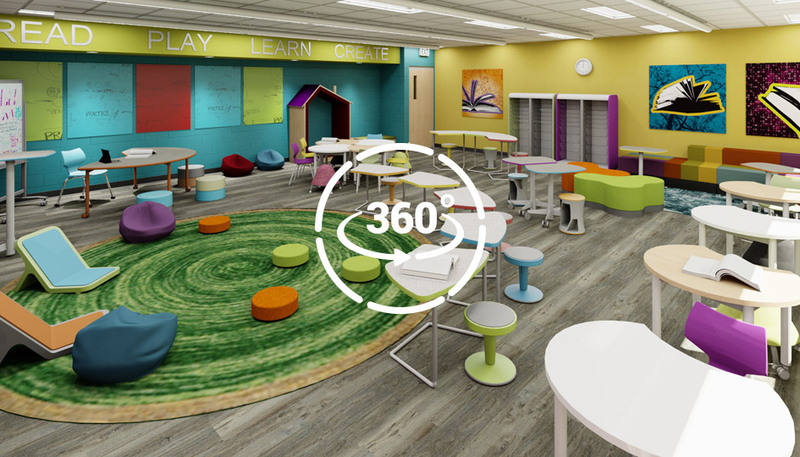 Our Demco Interiors blog features a great perspective on choosing furniture from Learning Environment Designer Marci Milius: Furniture Safety Tips for an Active Learning Environment. Has there been any study of how students behave out of school when they have been in a flexible classroom? My second grade son’s behavior has changed at home. Fo example, hard time sitting still at dinner time, has to be told to sit on bottom not knees, he just cannot be still. Other parents are noticing similar behavior of their kids. I am NOT a fan of flexible seating, not for second grade. Which tables from Ikea do you use for the stand up tables? There are a variety of options for standing-height tables. These MooreCo Sit/Stand Dry-erase Flipper tables give students varying height options, allow them to collaborate right on the table, and can be flipped up and moved out of the way when you need the space.